The Fältovn portable camp stove can heat your tent, dry your clothes, and cook your meal without putting any unnecessary pressure on nature. The CO2 it produces is oxygen for the trees. Burn a clean wood fire and you will be amazed by the amount of energy in just one dry log. Rediscover this fantastic wood energy source. 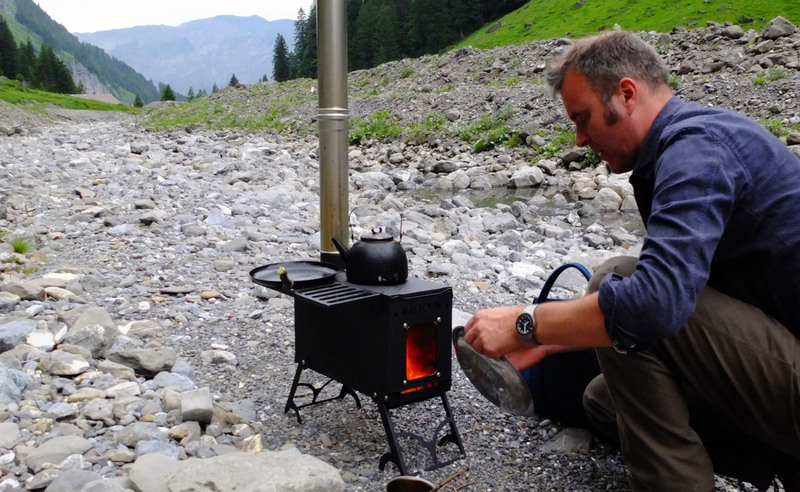 The Fältovn camp stove was developed and is manufactured by Harrie Leenders in the Netherlands as a tribute to the renowned Scandinavian outdoorsman and wilderness explorer Lars Fält of Sweden. 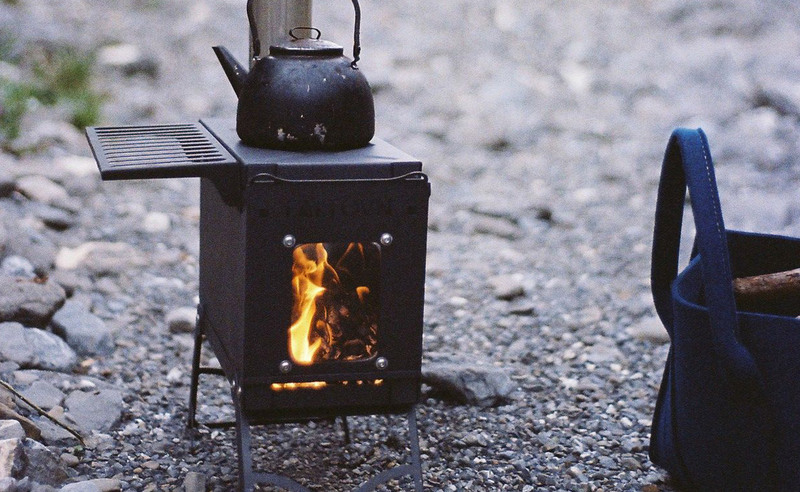 This small stove produces a nice hot fire by using preheated air from inside the stove that gets even hotter when it circulates against the reflection shield on the roof of the firebox. This process increases the efficiency of the stove and reduces fuel consumption. The door of the Faltovn works as the air control, leaving the door ajar gives the fire extra air. 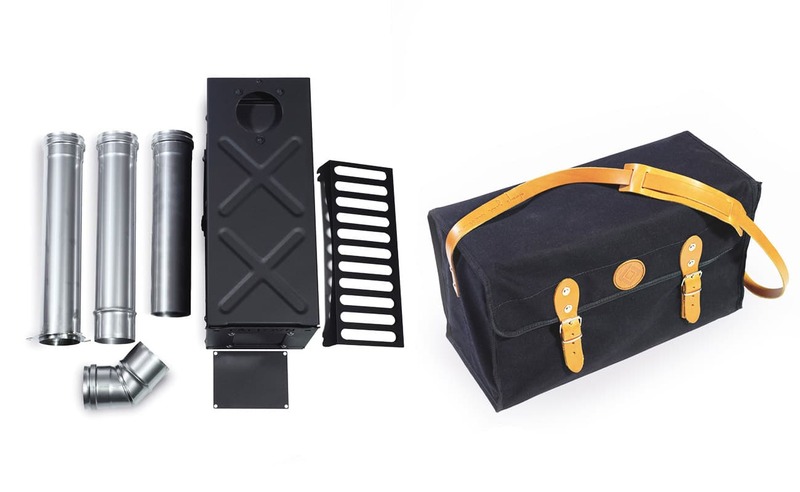 The Fältovn is a durable outdoor accessory that includes an extra thick top plate made for cooking and a side extension tray that is ideal for drying socks or keeping food warm. It also comes with a spare metal plate to use in an emergency if the glass breaks and three sections of pipe (shown at left). Note that each pipe is 16¾” (42.5cm) in length and 3” (8cm) in diameter, and they can be stored inside the stove for easy transport. Weighing only 22 pounds (10kg), the Faltovn is the perfect travel companion. It is easy to carry and provides warmth and comfort everywhere you go. It can also be used inside a tent and the pipe can be extended with a 45° elbow or standard insulated pipe for more reach. As an option, a black weather-proof vinyl carrying bag or a canvas bag (shown at bottom left) is available. 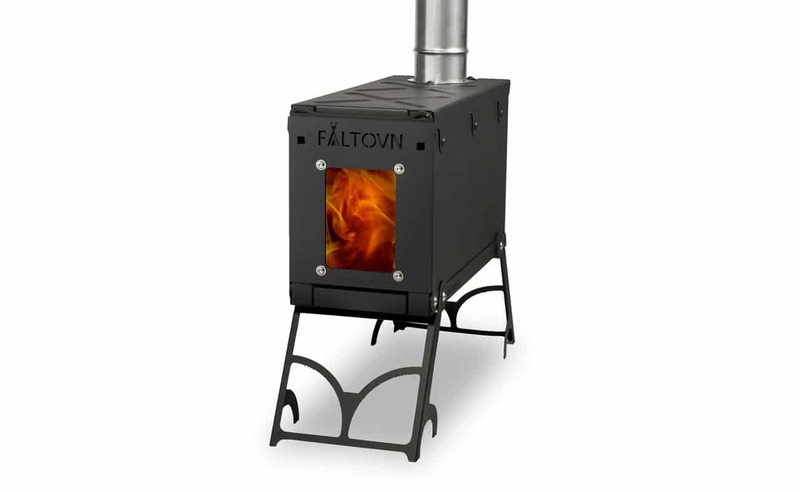 The Fältovn camp stove is a good reason to go out and experience nature. 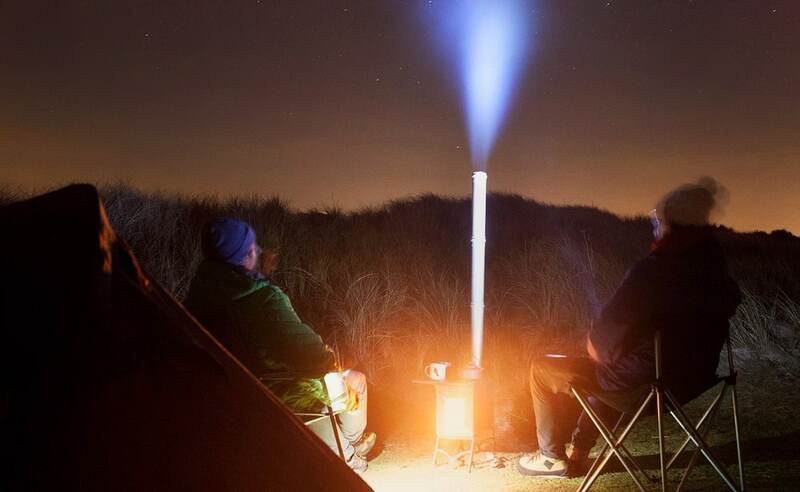 It’s a portable stove that offers warmth, ambiance, and the ability to cook a meal in the great outdoors whenever and wherever you want.